Denver Business School’s 11-month, full-time MBA follows an accelerated schedule in order to pack in 48 credit hours’ worth of courses in less than a year. The program is divided into five mini-terms of approximately eight weeks each, as well as a mandatory International Business Abroad course in the month of March. The school follows a cohort structure in which every student takes the same classes with the same group of people in order to emphasize collaboration and teamwork. Due to the rigorous accelerated schedule of the 11-month MBA, each student takes the same fixed courses. There are no core course waivers and no opportunity to choose individual elective options. Additionally, every student spends the month of March on an international trip, applying their learned skills to a practical business problem abroad. Classes meet four days a week, for two and a half hours in the morning and two and a half hours in the afternoon. Each and every course requires students to work with their cohort, and the school notes that it places a strong emphasis on this cohort structure so students can build lasting personal and professional relationships after their year-long program concludes. There are currently 22 students enrolled in the CU Denver Business School full-time MBA program. These students are 63.6 percent male and 36.4 percent female. The average GMAT score is 578 and the GPA of the class is 3.3. Students in the program are, on average, 30-years old. Each student is assigned a dedicated career advisor at the beginning of their first year. Denver Business School notes that 80 percent of MBA students attend business school to make a significant career change of some kind, and the advisors are there to guide each student through that process. In addition, the school offers workshops throughout the duration of the 11-month program. Workshop topics include Targeted Networking, Negotiating Offers, Identifying & Articulating Your Skills, and many more. The school takes advantage of its prime location in the heart of downtown Denver, just blocks from hundreds of thriving businesses. The Speaker Series brings industry professionals to campus to discuss industry-specific expertise, while business collaborations allow students to partner with local businesses to complete projects and practice solving real-world, current issues in their own city. Upon graduating, Denver Business School sees its students go on to hold positions in a variety of different industries, nearly evenly spread through sales & marketing, finance & accounting, information technology, startups & entrepreneurship, consulting, and nonprofit work. 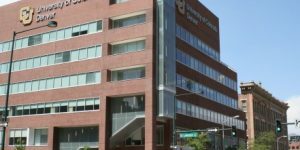 Tuition for the CU Denver full-time MBA program is $42,500, regardless of whether students are in-state or out-of-state residents. The university offers the 11-Month MBA Award, designed for students with excellent academic standing and who demonstrate both professional and academic potential. The award is distributed in five $1,000 segments, $1,000 per term. Additionally, the business school offers other merit scholarships, as well as public and private loans. Applicants to Denver Business School must submit a completed online application form, GMAT scores with a minimum of a 500, official transcripts from all institutions attended, a professional résumé, personal essays, two letters of recommendation, and a TOEFL or IELTS, if applicable, for non-native English speaking students or students that have not earned an undergraduate degree from an English-speaking university. Personal interviews may be required of applicants, and the admissions staff will contact students if they are selected for an interview.